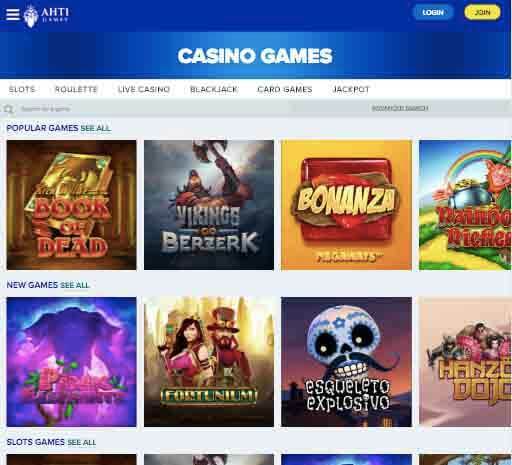 AHTI Games is a fairly new casino that started its operations just recently in 2018. The website is based off an underwater theme with AHTI the Disney king of the sees as its mascot. The casino is owned by SkillOnNet Ltd and is gaining popularity very fast compared to other casinos and given how new it is, really speaks to the quality of the site. It caught our attention and we have prepared a detailed AHTI Games Casino review, just for you. Players are greeted with a very vibrant and responsive site with primarily a blue colour scheme. From the visual aspect, AHTI has it covered very well. They offers an eye-catching design and that also adds to the appeal of the site itself. Let’s take a deeper look into the offering of the site, all that it has to offer and also some pros and cons. Read out full AHTI Games Casino review below. AHTI Games does not, unfortunately, accept players from every country. Due to some regulatory constraints, you can access AHTI from some selected countries only. Some of the countries that are allowed to access the site are Afghanistan, Aland Islands, Algeria, India, Switzerland, Germany, Oman, Congo, Denmark, Finland, United Arab Emirates, Taiwan, United Kingdom. Meanwhile, among the banned countries are: Unites States, Belgium, Russia, Poland, Turkey, Italy, Israel, Mexico, Canada and France. It is important to note that this is not an exhaustive list. It is not possible to mention all the countries that can or cannot access the casino. We recommend that you contact AHTI Games if you are unsure about your own country and give the terms and conditions a good read. With such a huge list of games and quality content, it is easy to get lost in the visuals and overall immersive look of the site. Players can get up and get running very quickly and create their accounts in a matter of minutes. The registration is easy and does not take that long, all you require is your name, address and your mobile number. The quality of an online casino site can be judged by its game portfolio and game providers. AHTI Games starts off with top game software names like GameArt, Real Time Gaming, NetEnt, Yggdrasil, NYX, Microgaming, Shuffle Master and lots more. The quality of the games at AHTI Games is a direct result of the top-notch game providers AHTI Games has partnered up with. All the games are very well designed and are responsive both in the desktop and the mobile versions of the casino. They feature great visuals with immersive sounds and excellent graphics. With a huge number of 1200 games players with different likes and preferences are sure to find a game that is suitable for them. Having a huge roster of games is one thing, but if the quality is just not there, the amount of games is meaningless. Luckily AHTI Games has not sacrificed on their quality also. All these are games are available for instant play as well. One interesting feature is that players do not need to create an account to search for the games. If you do not have an account, you can still see all the games that are available. And most of the games available can be played for free without having to sign up for an account. AHTI Games has a great selection of games such as Book of Dead, Black Ice, Adela, Starmania, Vikings. There are also quite a number of jackpot games such as Top Cat, Hall of Gods, Divine Fortune, Cashalot, Mega Fortune, and The Naked Gun to name a few. Beautifully designed games and site with a refreshing underwater theme. In addition to slots there are also roulette, blackjack and baccarat titles which feature the same top-notch quality. AHTI Games undoubtedly has an impressive list of quality games, given how new the casino is this is quite a feat. 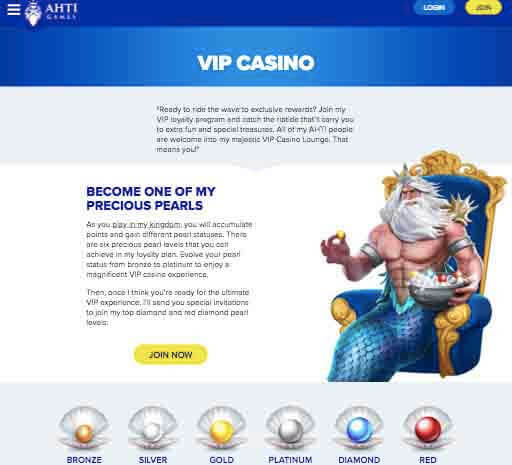 As a newcomer to the online casino industry, you can assume that AHTI Games will have enticing bonuses and welcome offers to encourage players to its site. And we are happy to confirm that you’re not wrong. All the offers available for AHTI are indeed very enticing and offers players great value for their money. One of their bonuses will give you 1 free spin for every pound that you deposit. In addition, when players register for the site for the first time the casino will reward 100% Welcome Bonus up to 100 free spins. Players can also win 30 spins in addition to 50 spins. You will also receive daily surprise offers and discounted spin packages which you can check out after you have logged in for the first time. Moreover, the casino also offers VIP Loyalty Club program for its most dedicated players. Players are rewarded loyalty points in the form of ‘pearls’ and there are 6 tiers that are available. They are bronze, silver, gold, platinum, diamond and red diamond. Each tier has better rewards than the previous. It is important to note that the last two stages of the VIP tiers are invitation only. Mobile casino is a must have feature in 2018. The option to pick up your mobile device and just start playing anywhere is a major convenience for people who prefer to play on the go. AHTI Games also has a well-polished and good selection of mobile casino games. You can find a variety of games such as slots, jackpots, table games and also live games. The games and the interface are very fluid due to its HTML 5 optimization. All the functionality of the full desktop site is available for the mobile platform as well. You can make easy deposit methods on your mobile as well using credit/debit cards or eWallets such as PayPal. We downloaded it ourselves to test it out for our AHTI Games Casino review. AHTI Games’ mobile version is available for iOS and Android platforms. Unfortunately, AHTI Games doesn’t seem to be any support for Windows Phone and Blackberry. The app features great design, keeping true to its underwater theme. Does AHTI Games Have a Live Casino? More and more casinos nowadays are paying good attention to the live section of their casino. It is surely becoming one of the most sorts after experiences from online casinos. Not having to leave the comfort of your own home and yet get a feel of being at a real casino with a real dealer is somewhat of a great experience. AHTI Games understands this and provides a respectable live casino experience for its players. This online casino offers live gambling from popular software providers namely Evolution Gaming, Extreme Live Gaming and NetEnt. That means you can be sure that the games are of high quality. What adds to the casino experience is that the dealers are also professional and polite. There are both male and female dealers, all well trained to make sure you will have a great experience gambling at AHTI Games’ live casino section. The streaming quality is very good and sharp, you should note that the quality of the stream will also depend on your internet connection. A good collection of games is available for the live section of the casino. Players can choose from a selection of roulette, blackjack and other games. All in all, the live casino is well put together and does a good job of simulating being in an actual casino. AHTI Games uses all the popular banking and payment methods. You can use traditional banking methods like debit/credit cards such as Visa, MasterCard and Maestro. In addition, there are other methods such as PayPal,Skrill, Neteller, Paysafecard and GiroPay. AHTI Games supports almost 60 currency which makes it very convenient for players from all over the world. There are no fees associated with AHTI Games for transactions. Players will receive money within hours of the same day if you chose to use electronic methods and 3 to 6 days if you use wire transfer or credit/debit cards. Upon making a request AHTI Games will ask you for verification. This is done so that the casino can prevent fraud and money laundering. After you have proven your identity you can easily withdrawal your winnings through all the various method available. The minimum amount of deposit is £20. Customer support is one of the most important aspects when it comes to any online casino. Especially when you are putting your own hard-earned money on the line you would want to know sure that if any problems would occur you can easily contact the casino and get it sorted. This peace of mind is very important for players to build a trusting relationship with the casinos they are playing with. Luckily AHTI Games understands this and offers a wide range of ways you can get in touch with them. The most convenient ways to get in touch with them is through live chat. The casino has a presence on social media like Facebook, Twitter and Instagram. Players can also get in touch with AHTI Games by using their social media pages. You might also take a glance at the FAQ sections to see if your problem has already been answered. If you would prefer a more formal approach you can email AHTI Games at [email protected] You can expect to get feedback within 24-48 hours. Overall the customer support from AHTI leaves nothing to be desired and you can rest assured there is a competent team of professionals on the other site that can help you with any sort of problems that may appear. AHTI Games is one of those casinos that has a refreshing website design and a good selection of casino games and bonuses. It slowly closing the gap between it and other well-established online casinos that have been operating for decades. This is a testament in itself to the quality that AHTI Games brings to its players. When it comes to security, you should never overlook it. When you are dealing real money from your players it pays to have good security. This prevents any unwanted attacks on the site and also prevents from the player’s sensitive information like bank details ending up in the wrong hands. AHTI Games uses 128-bit SSL encryption and firewalls to safeguard its site from threats and attacks. This means that the player information will be treated as confidential. You can rest assured that AHTI Games is doing the best it can to protect its customer’s information. AHTI Games holds licenses from the Malta Gaming Authority and UK licenses. They regulate AHTI’s operations. Malta Gaming Authority and UK Gambling Commission are one of the strictest regulators out there, so you can be sure all of the AHTI games are fair and are held to a very high standard. AHTI being a relatively new player in the online casino scene may make some players skeptical. But the licenses it holds gives it the credibility of the fairness of the games. They use random number generators (RNG) for the slot games making sure that everything is random and fair. Our conclusion after the AHTI Games Casino review is that AHTI Games is overall a great online casino for gamblers. It’s a beautiful underwater theme and collection of solid games and online slots can provide hours of fun gambling online. Coupled with the generous bonus offers we really do have a winner in our hands. Users will love its responsive and colourful design. Also, you can rest assured that all your data are kept secure. We can easily recommend AHTI to anyone.